Value holder for binary data. 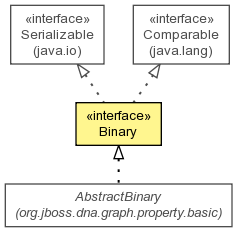 Binary instances are not mutable. Acquire any resources for this data. Get the contents of this data as a byte array. Get the SHA-1 hash of the contents. Get the length of this binary data. Get the contents of this data as a stream. Get the SHA-1 hash of the contents. This hash can be used to determine whether two Binary instances contain the same content. Repeatedly calling this method should generally be efficient, as it most implementations will compute the hash only once. the hash of the contents as a byte array, or an empty array if the hash could not be computed. Acquire any resources for this data. This method must be called before any other method on this object. Release any acquired resources. This method must be called after a client is finished with this value.